One of the many life-altering habits that began two years ago was setting goals for myself, both long and short-term. Since I began setting them, I've managed to cross many of my original ones off, though new ones are added in time to replace the old. We continue to be hard at work discovering the performance practice of the 18th century. New sources continue to be rediscovered, other known sources are reinterpreted but it is impossible to know exactly how one performed two hundred and fifty years ago - especially since recording technology hadn't yet been invented. Or had it? The basic principle is the same as a traditional pipe organ, but rather than being played by an organist, the barrel organ is activated either by a person turning a crank, or by clockwork driven by weights or springs. The pieces of music are encoded onto wooden barrels (or cylinders), which are analogous to the keyboard of the traditional pipe organ. Performances could be recorded using a keyboard which had needles attached to the keys, poking holes in paper which would eventually be wrapped around a barrel and serve as a guide for the 'pinning' of the metal which encoded the music. In the case of many earlier barrels, however, it is most likely that they were constructed in collaboration with a performer as the paper system described above wasn't commonly used until the early 19th century. 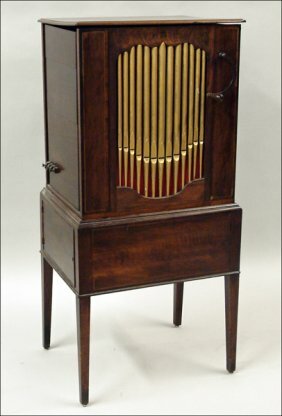 The instrument in the photo was made by John Langshaw in 1790. Langshaw lived in Lancaster and was praised for his barrel organ making by Handel and others. The full story can be read here. John Christopher Smith jr., the son of Handel's secretary and Handel's student in his later years, knew Langshaw well and it is suspected that he was involved in the making of the 1775 barrel which contains two of Handel's organ concerti. Below you will see three recorded versions of concerto no.5: the first, a standard performance (skip to 2:26); the second from the 1775 barrel, a recording of original performance practice; the third by Ton Koopman and the Amsterdam baroque orchestra, clearly under the influence of the mechanical recording. Are you surprised by the scores of ornaments in the barrel organ? I certainly was. What this mechanical recording shows us is not just how Handel might have performed, but how contemporaries would have done as it was recorded after his death. There is written evidence in a number of places which show the extent to which this ornamental practice from the first half of the 18th century continued all the way to the 19th (actually, this ornamental practice began much earlier, but I'm not going to dive into that). For example, take a look at Telemann's Methodical Sonatas and Ozi's Nouvelle méthode de basson. So why do we not allow ourselves more ornamental leeway today? Or is it just that we lack the skill? There are mechanical recordings, such as the one I've discussed above, of music by C.P.E. Bach, Mozart, and Beethoven by contemporaries. Maybe we should look to them to give us a better understanding of a usual performance of their works? I was very sad to hear yesterday that Jim Stockigt died on the 1st day of this month. Mr. Stockigt, a physician-endocrinologist and bassoonist, has done an important survey on bassoon repertoire and is the author of the Arias with Obbligato Bassoon Database, an incredible resource for all. Please visit his website if you haven't already.